Seven competitors from Wick triathlon club made the trip to Nairn for the Sprint triathlon on Sunday last. 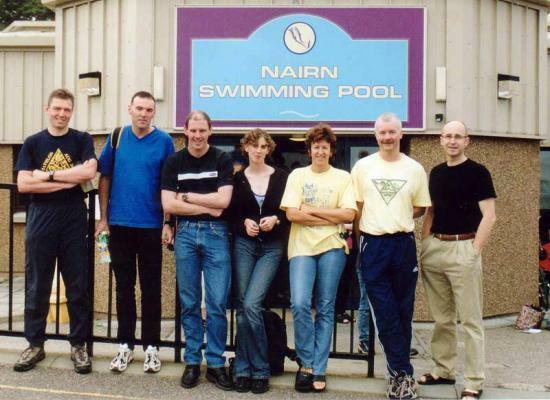 Excellent results were achieved by the Caithness Club for the event consisting of a 500 metre swim followed by a 20 km cycle and, immediately thereafter, a 6 km run. The strength of the Wick club was apparent by the fact that they outnumbered the home team! First in for the Wickers was David Sutherland with the time of 1 hour 4 minutes and 34 seconds, far ahead of any other club member. Another notable performance was a personal best by Gregg Binns who, unfortunately, suffered a bout of sickness immediately after the event, as a result of the huge effort expended. A terrific tussle took place between rivals Bruce de Wert and Brian Grant with Bruce eventually overtaking Brian on the final part of the run. Only 12 seconds separated Bruce, Brian and Gregg Binns, with Paul Bremner not far behind. Both ladies of the team provided excellent performances, with Suzanne Calder excelling in the swim stage. Wick Triathlon Club meets regularly and welcomes new members.